The price has been reduced to £30 (£10 off RRP) and while limited stocks last. They have been signed by William 9th Earl Of Radnor. You can place your order now for immediate despatch. Plus postage and packing (£2.80). Place orders by emailing books@longford.org.uk with your name address and telephone number or by phoning 01722-411616. Longford Castle is a fine Elizabethan country house, home to a world-class collection of art built up in the eighteenth and nineteenth centuries by the Bouverie family and still owned today by their descendants. Until now, it has been relatively less known amongst the pantheon of English country houses. This book, richly illustrated and based on extensive scholarly research into the family archive, tells a comprehensive story of the collectors who amassed these treasures. It explores the acquisition and commission of works of art from Holbein’s Erasmus and The Ambassadors, to exquisite landscapes by Claude and Poussin, and family portraits by Thomas Gainsborough and Sir Joshua Reynolds. 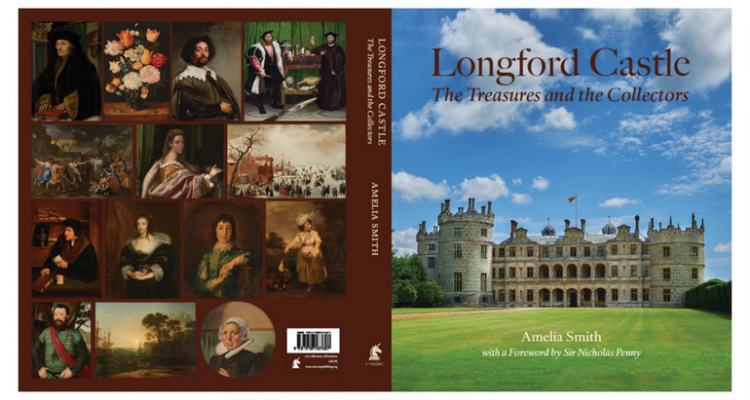 It explores how Longford, an unusual triangular-shaped castle that inspired Sir Philip Sidney’s Arcadia and doubled as The Palace of Genovia in Disney’s The Princess Diaries, was decorated and furnished to house these works of fine art. The book brings the story up to the present day, with an introduction and conclusion by the current owner, the 9th Earl of Radnor, himself a keen collector of art, to celebrate this remarkable house and collection. Amelia Smith grew up in Surrey and attended university in London, where she has recently completed her PhD. Amelia Smith graduated with a First Class degree in History of Art at University College London in 2012, where she was awarded the Gombrich Prize and Zilkha Prize in 2012. She went on to gain an MA in Curating the Art Museum at the Courtauld Institute of Art in 2013, leading to a curatorial internship at the National Portrait Gallery, researching for the exhibition ‘The Great War in Portraits’ (2014).